So Sunday (10/10/10) was our first competition of the semester at the University of Connecticut! Everyone somehow managed to get themselves to west campus at the wee hours of the morning for the bus to leave by 5:30. 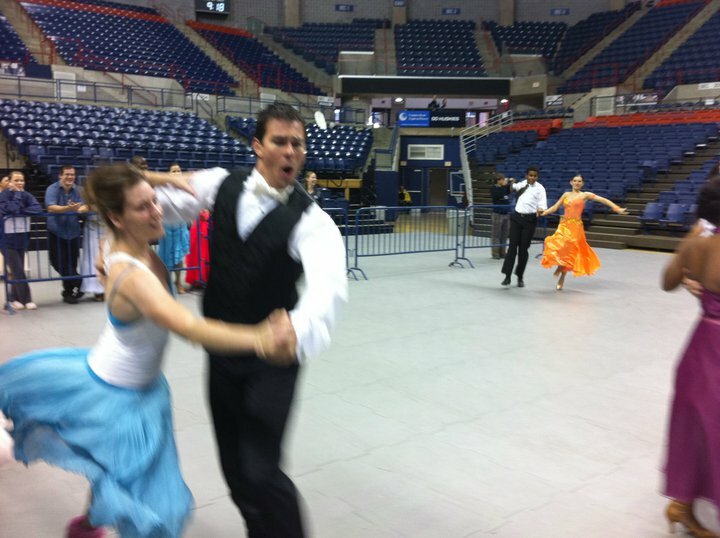 Then finally, after driving around in circles just a little bit we managed to find our way to Gampel Pavilion and start the getting dressed, doing hair, being sparkly, and in Danny’s case – sleeping. Then the competition started. 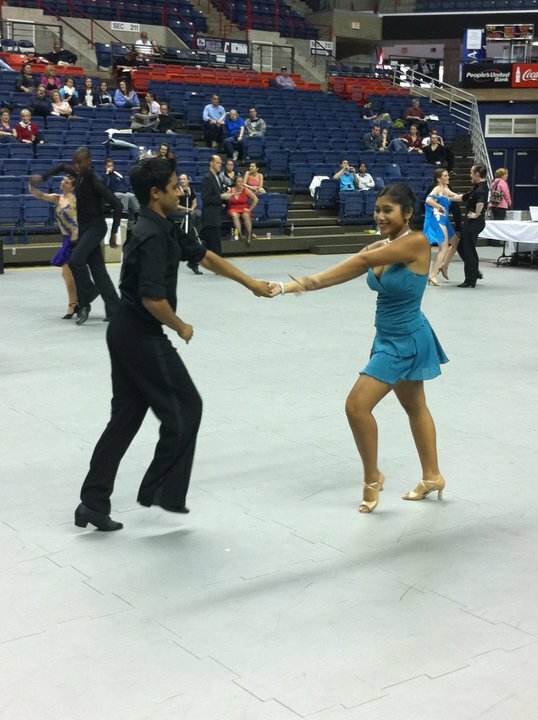 The standard and smooth rounds went really well and were punctuated by a fantastic rookie-veteran fun dance during which we danced a swing, polka, hustle, and samba. Harrison came in second with his fantastic sock-wearing samba and Steven snapped a picture of Mariah’s intense polka. Then the latin rounds started and we got to see Kristie’s sassy side come out, way to rock you two, keep it up. Everyone danced spectacularly and it was great watching you all do well! Kristie and Famil dancing the jive. So what started as an over-tired, way too early sort of cold day ended (still tiredly — exhaustedly), yet good. Everyone danced great and had fun which is the most important part. We had a great to kick off the competition season and I’m definitely looking forward to more competitions with you all throughout the year. Congratulations especially to those people whose first competition it was, keep up the good work! Get psyched for Harvard Beginners competition coming up on October 17th! We’re looking forward to having more of our new couples competing for the first time together on Sunday. It’s going to be another day full of sparkles, loud music, and dancing — I hope that you’re all excited, I know I am! Stay Sassy and Keep on Dancing!